Gaming laptops, contrary to their name, are not just built with the purpose of delivering an immersive experience of gameplay. They can be used for varied purposes too, like word processing, simple internet browsing as well as creating 3D models, to name a few. These laptops are fully integrated media systems, moving seamlessly from movie streaming to video games in the blink of an eye. Additionally, they boast of large screens with premium graphical abilities. And despite all the battery-draining features, these laptops are surprisingly robust and offer hours of continuous usage before running out on juice. While gaming laptops, are in general, believed to be pricey, there are still some models that offer a unique melange of price and performance in equal proportions. Here we review the top 9 gaming laptops under 1000 that fulfill your desire for immersive gameplay without making your wallet too light! The Dell Inspiron i7559-7512GRY from the House of Dell is a versatile gaming laptop powered by a 6th generation Intel i7 Quad-core processor that lets you juggle games and work seamlessly. The brilliant 4k Ultra HD Touch display is driven by a dedicated NVIDIA GTX 960M 4GB discrete graphics card which fulfills your need for responsive gaming and lifelike visualization. The 4k touchscreen comes with the promise of premium image quality and color production. The combination of an i7 quad-core, 16 GB RAM, SSD, as well as 4GB discrete graphics card makes the system surprisingly fast for the money. Additionally, it comes preinstalled with Windows 10 to help you multitask with ease. The keyboard seems perfect for typing, with keys decently sized and spaced thoughtfully apart. There is also an included backlit in the keyboard to enable typing in low-lit conditions. Read all the specifications here. ASUS ROG G751 is one of those budget-friendly gaming laptops under 1000 that has been designed with speed in mind. Armed with an Intel Core i7 Quad-Core processor, the G571 features a 17-inch screen driven by NVIDIA GeForce GTX Series graphics that just takes gaming to a whole new level altogether. Thanks to the quick-access keys, recording gameplay, and booting steam have never been easier. The ROG key helps you access the Gaming Center Dashboard and set up your very own profile for a more personalized gaming. Another highlight of the G571 is its one-piece backlit keyboard, which is extremely responsive and offers maximum visibility in low-lit conditions. Simply put, if you wish to play games on a limited budget, then this ASUS is bound to bring a smile on your face! Check out the full range of specifications of this marvel of a laptop here. Armed with the all-new 6th generation Intel Core i7 processor, the MSI GE72 Apache Pro-003 is one of the best choices available for those looking for a big-screen gaming laptop at a reasonable price. Powered by the latest NVIDIA GeForce GTX 970M graphics, this system is designed for playing advanced PC games at high settings. The full 17.3″ HD display guarantees vivid, powerful graphics and accurate colors at high-definition. Run on Windows 10, the MSI GE72 Apache provides peak performance for both work and play. For its size, this laptop is ultra-portable and doesn’t feel like a drag when carrying around. Learn more about the features and latest price of the MSI GE72 here. With its unique combination of novel features, the Aspire V17 Nitro-Black Edition represents the pinnacle of the Aspire V Nitro Series. It flaunts a sharp, sleek design with defined angles that make it a visual treat. However, it’s much more than just a pretty face. Beneath the seemingly simple 1-inch profile lies a powerhouse of features. One of them is the latest 6th generation Intel Core i7 processor that powers the system to make computing alarmingly fast. You can watch movies, play games, engage yourself in video chats and all you want at one go. To top it all, the amazing battery life keeps you productive at all times. For a lightweight and cheap gaming laptop like this one, the NVIDIA GTX 960M is probably the best graphics card you can get! Another fascinating aspect of this system is that it’s equipped with the futuristic 802.11 ac wireless that helps you experience 3x faster performance in all your tasks, right from online gaming to streaming videos. Get a better idea of the price of the all-new Aspire V17 Nitro-Black Edition here. The Lenovo Z70 17.3″ laptop is an affordable system that can easily replace a desktop to suit the needs of users. Equipped with a cutting-edge intel processor and discrete NVIDIA graphics, it offers the pleasure of experiencing high-octane gameplay and breathtaking visuals during video streaming. The modern JBL speakers provide premium sound quality that is remarkably good for a laptop of this cost. The 17.3″ screen is perfect to watch details from extreme viewing angles. In spite of being just the base model of Z series, the Z70 with its i5 processor, NVIDIA GeForce 840M graphics and 8GB of RAM can handle practically anything you throw at it. The fact that is comes with an inbuilt DVD drive makes it a winner! Z70 exhibits excellent build quality, with lots of ports and a responsive keyboard that has a nice tactile feel. It’s not free of flaws, but it sure ticks most of the “good feature” boxes of a robust gaming laptop. Read all the specifications of the Lenovo Z70 here. Built for the sole purpose of gaming, the IdeaPad Y700 delivers the perfect combination of power-packed gaming with the mobility of notebook PCs. The 15.6-inch FHD display makes for an immersive gaming experience replete with realistic 3D-effects, razor-sharp resolution, and intense color clarity. Added to that is the powerful JBL speakers that provide strong surround sound, enabling you to switch off from the mundane world and revel in amazing play. In the heat of a challenging game where under-performance is never an option, the Ideapad Y700 comes backed by the futuristic Intel Core quad-core processor to give you the raw power needed to defeat anything or anyone that gets in your way. Additionally, the backlit keyboard has two different level of brightness control to ensure maximum visibility in dark conditions. Check out the latest price of Ideapad Y700 here. The X571LX by ASUS is a 17-inch, full HD gaming laptop with premium features that are hard to find in gaming laptops under 1000. This latest offering from ASUS is largely aimed towards casual gamers and multimedia users. Fueled by the modern Intel Core i7-5500U 2.4 GHz Processor, X571LX allows you to run multiple programs with great ease and speed. The dedicated NVIDIA GeForce GTX950M GPU with a 2GB GDDR3 VRAM allows gaming but at medium settings. The laptop supports a decent screen size of 17-inch with a full HD display, which is, in fact, the biggest displays available at this price range. The color production is good and the texts seem sharp and saturated. Overall, the X571LX by ASUS does fulfill your need for a superior gaming experience, and that too without breaking the bank! Get further details of the ASUS X571LX here. The MSI GL72 6QF-405 GL is a high-value gaming laptop that provides speedy performance, bright full HD display, high-capacity hard drive, amazing graphics performance and ultra-fast connectivity in a dangerously irresistible package. Powered by the blazing-fast 6th generation i7-6700HD quad-core processor, MSI GL72 is supported by a 6MB L3 cache that allows you to handle heavy-duty tasks like creating 3D models, playing high-end PC games and full HD media files effortlessly. The system runs on the latest Windows 10 to provide smooth, speedy gameplay at high settings. Although it doesn’t have an SSD storage, it does feature a massive 1 TB hard drive which gives you enough space to store your favorite HD movies, games, songs and important documents. Read the complete list of specifications of the MSI GL72 here. 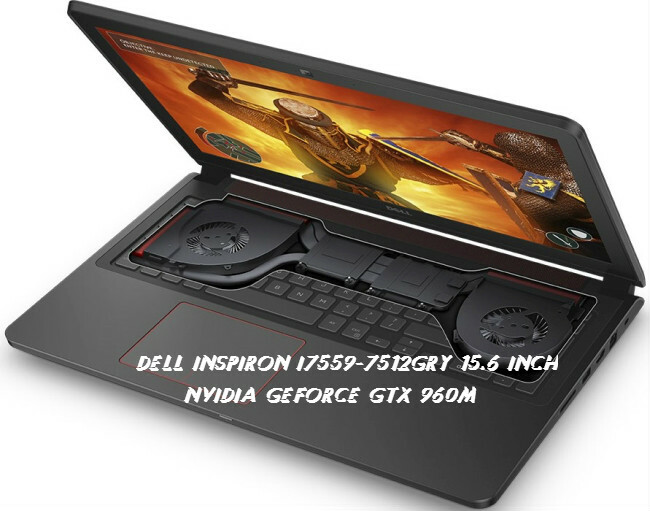 At the first glance, Dell’s Inspiron 15 7559 Gaming Laptop may seem big and heavy but its features and reasonable price make it a suitable choice for people on the lookout for budget gaming laptops under 1000. When it comes to executing tasks like creating 3D models, streaming videos, watching YouTube, browsing the web or checking emails, the Inspiron 15 7559 runs quite smoothly. Additionally, it comes preinstalled with the Windows 10 to make for speedy running of apps. The NVIDIA GeForce GTX 960M 4GB graphics card allows users to play recent games like Black Ops III, Cause 3, as well as Call of Duty. Although it has only a 2GB RAM, you can still add some more RAM to attain peak performance. Upgrade is easy with this system. Check out the full range of specifications as well as the latest price of Inspiron 15 7559 here. Whether you wish to play advanced PC games like counter strike and GTA V or more outdated versions, the aforementioned gaming laptops under 1000 do serve the purpose. They deliver peak performance during intense moments of gameplay and their long battery life keeps you engaged during those boring hours. And the best part is that they’re extremely affordable for their functionality. Needless to say, with their sleek finish, intuitive features and blazing-fast operation, these gaming laptops under 1000 are quite likely to spoil you for choice! Nice list of best gaming laptops. Thanks for sharing such a good information. Wow, very nice list. Thanks for sharing, will buy Dell Inspiron i7559. Looks good. I am using ASUS ROG since long and i am very satisfied its working. its very good laptop. Thanks for sharing the cool list of a top gaming laptop, But I have used Dell Inspiron i7559-7512GRY and Lenovo Y700 15.6-Inch Gaming Laptop, they both are good for the daily purpose, but if you play GTA 5 or need for speed no limits, your laptop will start heating after 20-35 minutes. All specifications are fine but we need to upgrade the RAM. Plus one for Asus ROG, it helping me on my day to day task and love to play games on it for hours. Hello, According to me ASUS ROG G751JL-WH71 is an awesome one. Acer Aspire V17 is also a nice for gaming. I am going for dell 7559, hope its good. Also, are you expecting any good new gaming laptop in 2018 first quarter?